Students, can you answer this riddle? What weighs 10 tons, involves elbow grease but also a delicate touch, takes large amounts of creativity and incorporates life and death? Answer: a romantic sand sculpture created by four educators. “It’s like life. It’s here today and gone tomorrow,” said Daniel Gutowski, a PE instructor and administrative services supervisor at Miramar College. He described his team’s sculpture, “Love Notes,” in the seventh annual U.S. 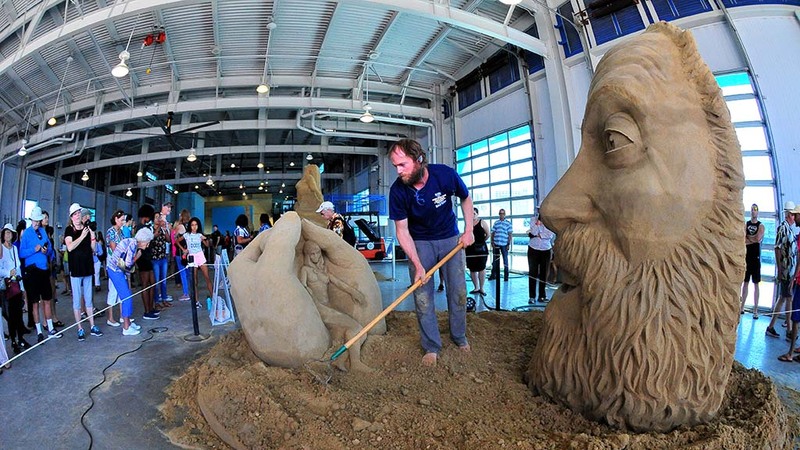 Sand Sculpting Challenge at the Broadway Pier through Labor Day — held indoors this year. Twelve master sculptors from around the world were invited to form 300 tons of sand into entertaining or thought-provoking works of art under the theme “Celebration” in two categories: solo and team competition. Solo artists finished their creations Saturday afternoon after up to four days of craftsmanship. Team artists started Saturday, but must be finished in time for judging at 2 p.m. Sunday. At stake is more than $60,000 in prizes. The sculptures ranged from animals and angels to lovers and liberation. Also featured are food trucks, music, craft booths and kids activities. Gutowski’s Sand Squirrels teammates are Peter Remenicky, an art teacher in Henrietta, New York; Bill Osborn, an IT trainer in education systems; and Meg Eckles, biology professor at Southwestern College, who started this collaboration 28 years ago. The group entered the annual Imperial Beach sand sculpting competition and 10 years later took first. Sand has glued them together ever since. Each team member works on a different part of the sculpture and then work together on connecting pieces, which can get a little edgy. “It’s like ‘Don’t sculpt there. You’re going to cut off my ear! No, that’s my nose!’ It takes a lot of good, close friendship to pull this off,” Gutowski said. The creative process started about six months ago with about 30 designs. Once a consensus was reached, a sketch was made of two people embracing — with the woman’s hair flowing to form musical notes that wrap around a heart and tower. The team took sculpting lessons at Balboa Park’s art district and learned using clay. Their goal was to learn how to add emotion to their creation. But with the move to a different medium — sand — came a quantitative problem. The Sand Squirrels are up against I.B. Posse and Mission Viejo-based Archisand, both having competed at least 30 years, he said. Sculptor Abram Waterman of Prince Edward Island in Canada had a different take on the art. “This is 3 1/2 days of carving. whereas if you are carving in wood or stone or another medium, you can make that weeks or months,” said Waterman, who took second last year. He created a sculpture, “To Have and to Hold,” involving a self-portrait of a man holding “the little woman” in his hands with a look of delight. A married couple is carved into the back. Waterman was married last year. Gates open at 10 a.m. Sunday and close at 7 p.m., with the awards ceremony about 5 p.m. The event closes at 9 p.m. Labor Day. Tickets are at the Broadway Pier, 1000 N. Harbor Drive. Adults are $15 plus a $1.39 fee; seniors 62 and over, $12 plus a $1.29 service fee; and children 2 to 12, $11 plus a $1.29 service fee. Free admission is offered active military, San Diego police and fire department personnel and other first responders with identification. VIP tickets may also be purchased.